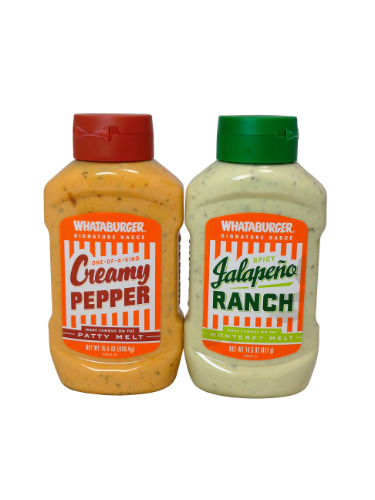 FRESH 20oz plastic bottles of the Texas legendary Whataburger Creamy Pepper sauce and Jalapeno Ranch sauce pack!! Perfect gift for any mis-placed Texans or for a friend! Whataburger one-of-a-Kind Creamy Pepper Sauce is the perfect combination of peppery, creamy goodness. Bring the classic Whataburger taste home and use as a spread for your favorite burgers, deli sandwiches, hot dogs, and more! This sauce made the patty melt famous! Bring a little zest to the table with Whataburger’s Spicy Jalapeño Ranch! This fiery sauce can be used as a dip or a dressing to add the perfect amount of spice to chicken, beef, vegetables, and more. The sauce that made the Monterey Melt famous!